It might take a bit long to uncover it all. Fortnite: Battle Royale players continue to dig out dirt chunks from the island, this time uncovering new secrets under Dusty Divot. 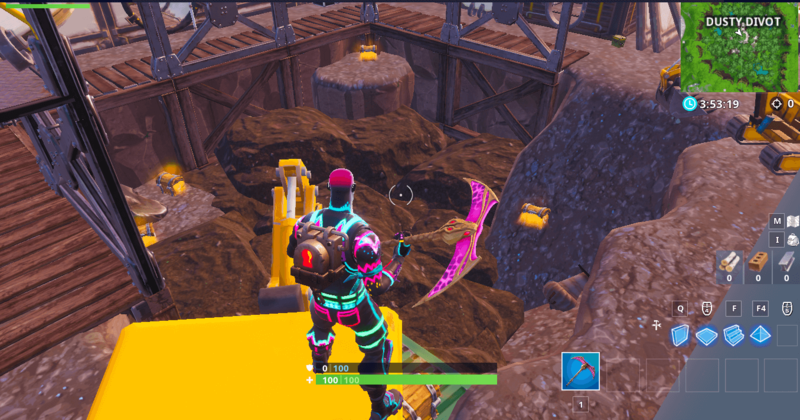 A new excavation site has almost been fully dug up today by Fortnite players all around the world. Players spotted it a few days after they finished work on a similar one near Paradise Palms. Just like in that case, players who hit the dirt chunks in Dusty Divot will reduce the health points of that chunk on the server side, and their damage will show up as a passive health decrease of that same chunk for other players in the world in any match. Each chunk has one million health points. When players finished with the Paradise Palms excavation site, they’d uncovered about three treasure chests and a new Volcano Vent that became permanent changes in that area of the Fortnite island. With the most recent excavation at Dusty Divot, players have already uncovered five chest spawns. There are about other six chunks that can be destroyed to uncover something else hidden under them. It’s still unknown why these excavation sites are popping up around the island. Players should expect more of them to show up in the next few days, probably with more chest spawns and some other simple but new interactions players can have with that area of the map, such as more Volcano Vents. Since we’re approaching the second half of season eight, they could even be related to some kind of season finale event. If you’re curious about what’s happening, grab your pickaxe and start working.